The Vortex Razor HD 11-33x50mm Angled Spotting Scope Kit is lightweight and ultra-compact featuring a triplet apochromatic lens system that delivers high-definition views across the entire field of view. Compete at the highest level with an ultra-compact Razor HD spotting scope that you can pack and take anywhere. 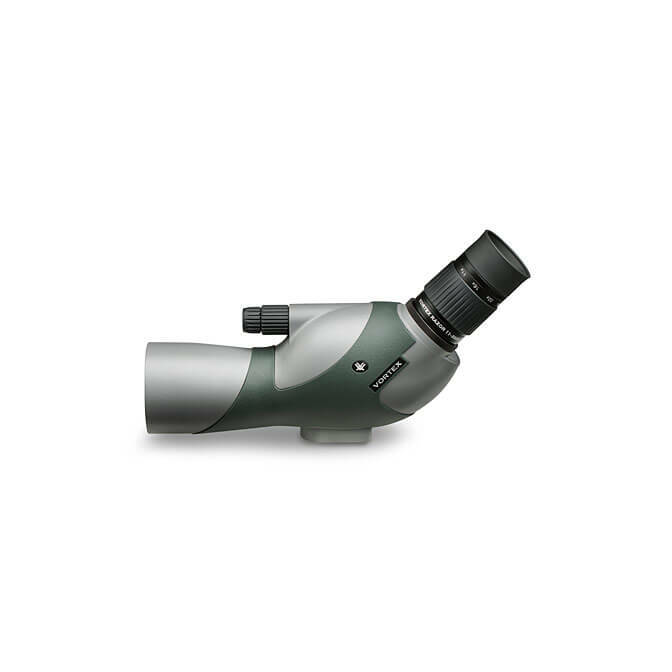 The sophisticated triplet apochromatic lens system delivers high-definition views across the entire field of view on this Vortex Razor HD 11-33x50mm Angled Spotting Scope Kit. HD premium high density extra-low dispersion glass lens elements are carefully selected and precision-crafted to exacting standards for true-to-life images of startling clarity, resolution and color accuracy. With this scope there is no color fringing, degradation of resolution or dilution of color fidelity at longer viewing distances. Exterior lenses are protected by ArmorTek—an ultrahard, scratch-resistant compound that repels oil, dirt and the corrosive salts of fingerprints. Fully multi-coated with scratch-resistant XR coatings for extremely high resolution and optimal light transmission. A die-cast magnesium alloy body with strategically-placed rubber armoring ensures ultimate strength, durability and lightweight performance. You’ll be happy that you brought this outstanding small scope along with you, whether you’re hiking, camping or flying to a tropical birding location. High-density (HD) Glass Enhances resolution, color, and contrast. Fully Multi-coated Lenses Increase light transmission with multiple anti-reflective coatings on all air-to-glass surfaces. Broadband lens coatings. BaK-4 Prisms Optimize light transmission through the prisms. Porro Prisms offer maximum image quality and durability in a traditional design. Angled Body design that Is favored by users of different heights for viewing without adjusting the tripod height as frequently. The angled design works well when viewing at an upward angle. Dual Focus allows for precision with coarse and fine adjustments. Sunshade reduces glare and shields the objective lens from raindrops. Rotating Tripod Ring allows greater flexibility when positioning the spotting scope. Fogproof Barrel is filled with argon gas to inhibit internal fogging. ArmorTek Lens Coating repels oils on outer glass surfaces.